Passover was always on the 14th day of Nisan, also known as Abib, the first month of the Jewish religious calendar. The months always began with the first sighting of a crescent moon following the new moon. (I'm using the term "new moon" to refer to when the moon was first unable to be seen.) 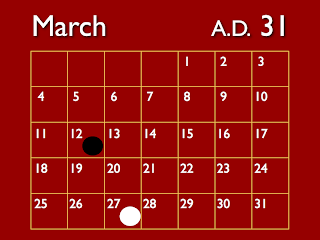 According to astronomical records, there was a new moon on March 12 (our calendar) in the year AD 31, and the full moon came on March 27. 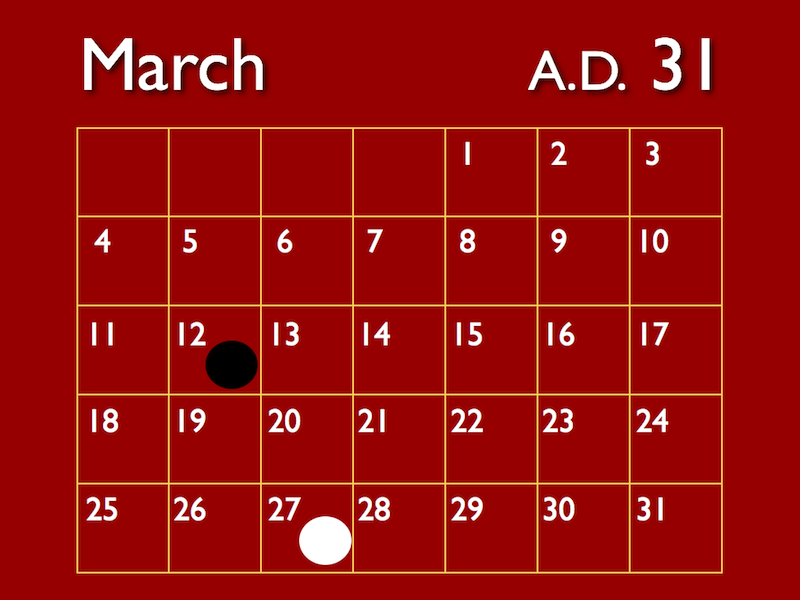 Depending on when the crescent was first observed, the 14th day of the Jewish month would have landed sometime around March 28. I don't think we could stretch it to Friday the 30th. So this month doesn't seem to fit what we're looking for. Furthermore, it is doubtful that Passover in those days was ever observed that early in the year. They needed ripe barley for the wave sheaf offering, and according to the Israeli Ministry of Agriculture, barley is not usually ripe in Israel until later in April. So it looks like this month wouldn't qualify as the first month of the year anyway. They often had to add a thirteenth month to keep the calendar lined up correctly with the seasons. The next new moon fell on April 10 of that year. 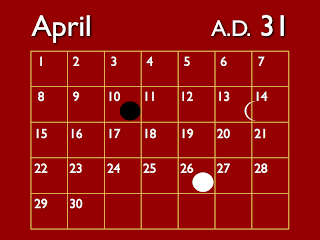 If the new crescent was first observed in the evening of what we call April 13, the first day of Nisan would have been counted from sunset on April 13 until sunset on April 14 of our Gregorian calendar. The fourteenth day of that first month, Passover Day, would have been celebrated from sundown on Thursday, April 26, until sundown on Friday, April 27. 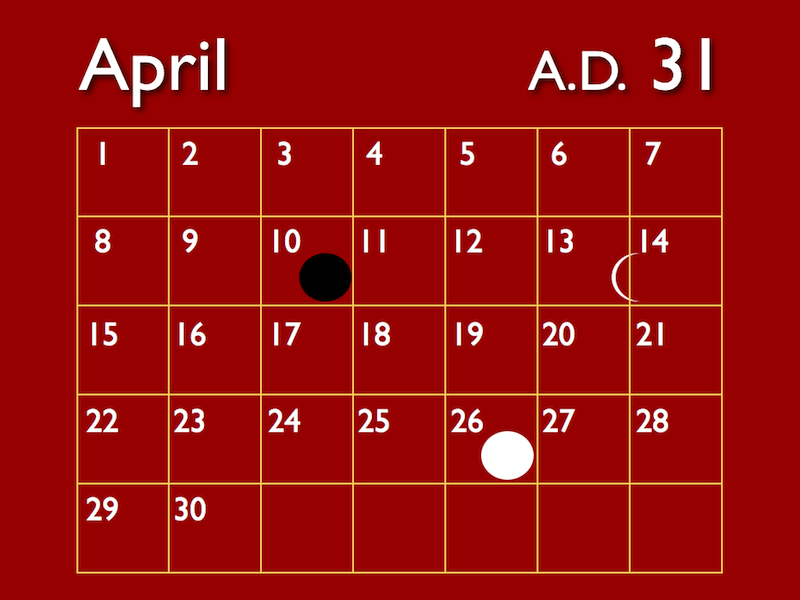 That makes Friday, April 27, AD 31, the most likely date for Jesus' crucifixion. And Sunday, April 29, would have been the day of His resurrection.